The solution to our world’s biggest problems could be trapped in the mind of that student building her first robot. Don’t you want to see what she can do? We do, too. That’s why we hope you’ll #doSTEMLEX. doyenne360 is a woman-owned, social impact, technology startup. We’re solving big, messy problems in education with our solution called STEMLEX. STEMLEX is modular curriculum + STEM hands-on activity kits + AI-powered enabling technology. We've set out to make it really easy for educators to get the STEM session materials they want, when they want it. 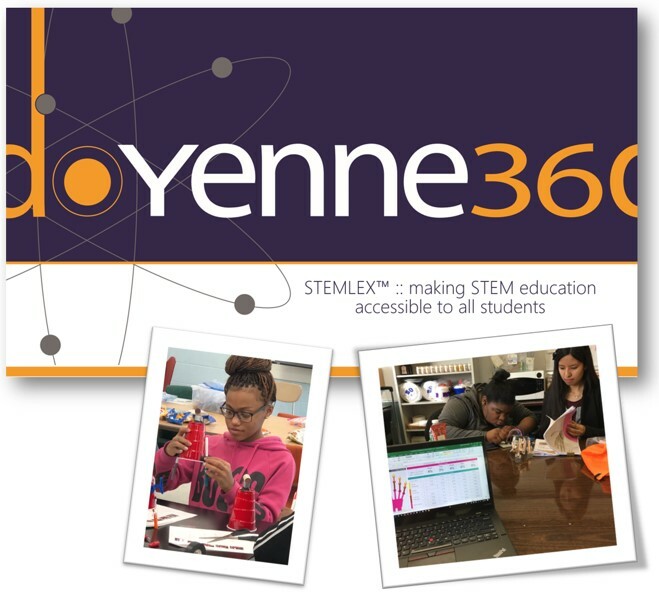 STEMLEX provides busy educators with all the components they need to make hands-on STEM activities easy to customize, receive, and measure for effectiveness. Have 20 students for 80 minutes one week, with 10 students for 30 minutes another? No problem! Quickly choose the curriculum, lesson plans, and hands-on STEM kits that fit your needs. Have the sudden urge on Tuesday to try making a robot with your students on Thursday? We got you! Get the hands-on STEM kits you want, just in time for when you want them. Wondering which STEM hands-on activity your students might like? No need to guess! Our analytics engine predicts which modules your students are most-likely to want to do next. STEMLEX is rapidly evolving as we participate in the Sky High EdTech Accelerator with Start Co in Memphis. Sign-up here to receive weekly updates about how we're progressing.